Back to school is a busy time of year for everyone, but especially for teachers and administrators. 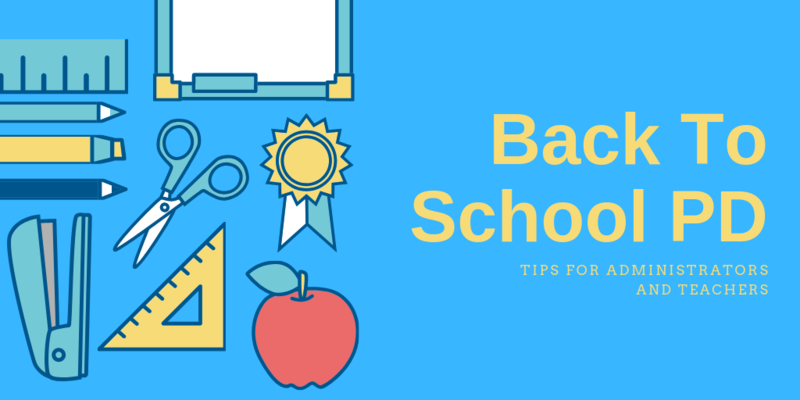 In the midst of lesson planning, classroom organization and student orientation it’s easy for back to school PD to become just another item on an ever-growing to-do list. So what can you do to make the most of PD and ensure it actually impacts teaching? These simple tips can help. Keep it simple: At this time of year teachers’ brains are already filled to the brim, so it may not be the best time to introduce a new and complicated filing system, testing process or IEP procedure. Instead, choose one simple message and really drive it home. Make it inspirational: As the school year starts, even the most seasoned teachers are bright eyed and busy tailed. Routines have yet to be established and teachers are more willing to accept change. This is your chance to get everyone on board for a fantastic behavior initiative, or an out of this world hands on approach to learning. Present the big idea now and build support for your vision. You’ll have the rest of the year to get down to the nitty gritty. Repeat, repeat and repeat again: Whatever you choose for your back to school PD, don’t stop there. Research has shown that the most effective PD is revisited throughout the school year (and even in following years). Choose an initiative and dedicate your year to it. Enter with an open mind: Teachers love routines and it’s easy to fall into a pattern of doing things a certain way simply because it’s the way you’ve always done it. That said, sometimes change is good and the beginning of the year is the perfect time to expand your horizons and try something new. So do your best to head into your back to school PD with a flexible mindset. You may be pleasantly surprised. Save everything: There is so much on teachers’ minds at the beginning of the year that it can be easy for back to school PD to accidentally go in one ear and out the other. Take notes, save handouts and maybe even ask for the presenter’s slides. You’ll be surprised how much you can learn on a second look when you revisit the material after a few weeks in the classroom. Leave your lists: The beginning of the school year may arguably be the busiest time for teachers and the to-do lists can be overwhelming. They take over your weekends, distract you from your social life and keep you up in the middle of the night. If you want to benefit from this year’s back to school PD, do yourself a favor and don’t bring your lists! Make a conscious choice as you enter the room to do your very best to focus on the presenter and let your to-do list go. Chances are you’ll leave refreshed and ready to tackle your lists with new excitement. Best of luck to you as you head into the school year! Whatever this year brings your way, remember the importance of your job and never underestimate the importance of each mind you’re shaping on a daily basis.